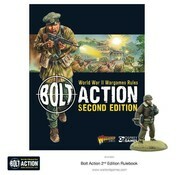 Bolt Action Starter Set - Contains two armies, the full rules and everything you need to get playing. Includes army lists for Germany and the US. You can play a fun game with just a squad or two each, and your forces will soon expand ready for bigger battles. The rules explain how to fight a battle, issuing orders to your units to move, shoot or assault at close quarters. They also cover how to pick two evenly matched forces and provide a range of exciting scenarios to fight out! Some gamers like to build a fully modelled battleground, but you can have a brilliant game on the kitchen table. Try to avoid having to abandon your battle for the evening meal though. You can even play on the floor - just watch out for careless feet or marauding cats! For an entertaining game of Bolt Action, it's important to give your troops some cover and objectives to seize on the battlefield. Besides, creating the scene is part of the appeal of World War 2 wargaming. You can buy terrain or build it from scratch, but for your first few games, a pile of books serves well as a hill and a few boxes as a buildings. 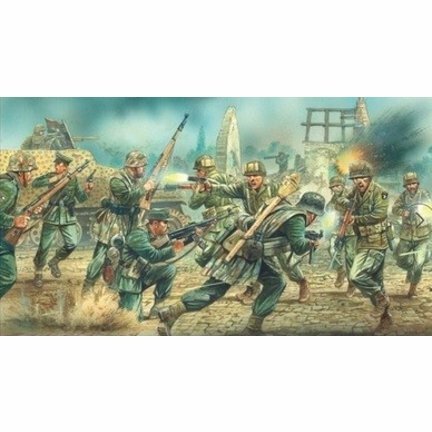 Putting together a Bolt Action force is lots of fun and there is a huge array of choices. Start with your infantry and then add vehicles and artillery. A fully painted army is an awesome sight and a great achievement, and this part of the wargaming hobby is just as rewarding as playing battles. Start simply and your skills will quickly improve as you practice.